The Dungeon temple just outside the city holds a secret Gold. To ensure the safety of the city you need to bring that Gold. The game play starts as an endless runner in this jockey run simulator game. You have to break into the temple and get that diamond. The ultimate run begins when you run to escape the temple but a dragon monster is awaken and the chase begins. There is no way to go but run in this 3d endless run away simulator. Play as a jockey man in this horse racing simulator game of 2019. Jockey man speed is the key to take the gold from the ancient temple because dragon is so fast to chase the jockey man adventure. Your jockey horse has gone wild and running over hurdles. 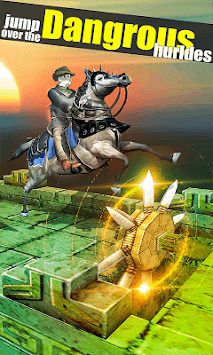 The ghost is also a horse rider and is chasing you in this 3d temple horse run simulation game. This is never ending adventure with the path filled with jewels, diamonds, power-ups, obstacles and hurdles. Keep collecting the diamonds along the running path. Be the hero to survive the ghost attack in this endless run. It is very simple. 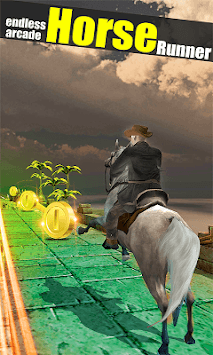 Swipe right to move to right to control horse, swipe left to move to horse left and swipe up to jump horse while running in the dungeon Jockey temple archer escape runner game. Use arrows to kill zombies on running horse. Use save me button when you are dead or killer by obstacles or zombies in dungeon jockey archer run free temple horse 3D game. Buy lives if you like to have more lives to save yourself in our temple style subway game! - Real 3D graphics and dungeon environment. - Accurate shooting while horse running. 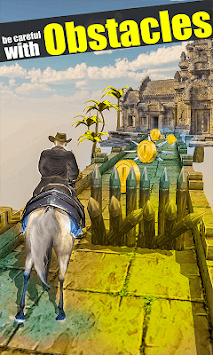 - Addictive, loving & fun game play of temple jockey horse run free game.